Ever wondered how content marketers drive a lot of traffic, links and shares to their blog posts within days of publishing them? Today I’m going to show you how can do this too- step by step. And I’m going to show you over-the-shoulder how I go about promoting a content piece of mine. Say hello to influencer marketing. Disclaimer: This strategy isn’t new at all. In fact, many of you might be already doing it, but today, I’m going to show you how you can scale the process while maintaining a healthy return on the time you invest in it. Influencers are simply authorities in your target niche that your target audience already admire and follow. You might have already guessed where I’m going with this – this process details how you can strategically establish relationships with proven influencers in your target niche, and then get them to promote your content. And all this is done using the most powerful medium of all – social media. For the sake of this example, I’m going to promote my interactive gallery on ecommerce designs. I first need to find out content similar to that of mine. First, I go to Search settings in Chrome. 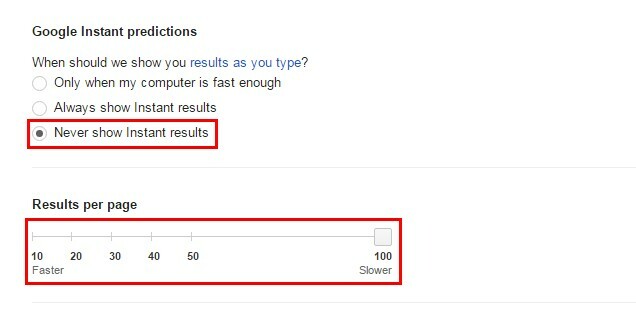 And then turn off instant results, and set the ‘Results per page’ as 100. Now google shows 100 results instead of 10 in every SERP. Next I simply search for “ecommerce designs” (note that it’s in “ ”). Boom! 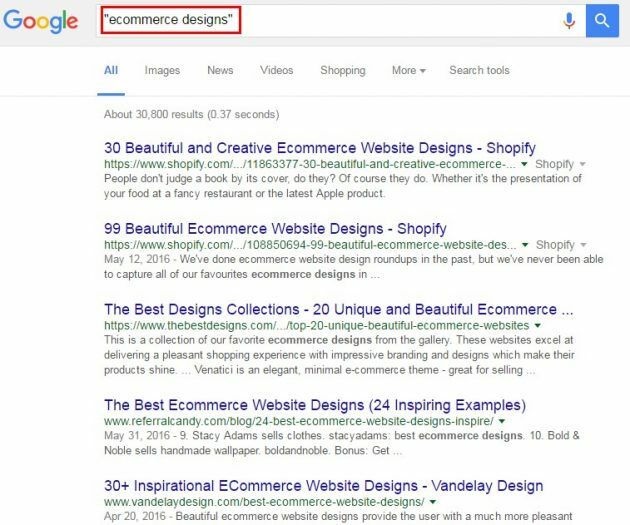 Google pulls a list of all sorts of blog posts and resources on good ecommerce designs. Next, we have to get this list of blog posts into a spreadsheet. A CSV with the page URLs, titles, descriptions and domain authorities of all 100 results downloads automatically. Just copy/paste the page URL and titles into a Gdoc- we will need these later in the process. Next is the filtering part- we need to go through each of these posts and make sure they are valid blogposts or resources. Just remove everything else. Just ask yourself this question as you go through each URL- do you like the resource, and would you share it? If you won’t share it, remove it. This will take some time, but I suggest you do this step right. Bonus tip: If you’d like to complete this step in a jiffy, just take a look the the title of each blogpost, and you should be able to guess which of these are valid blogposts or resources. Next, we simply find out who shared the blogposts in our list. Now how are we going to do that? For those of you who are new to Buzzsumo, it’s a nifty tool that tracks social activity around online content. Using buzzsumo, you can find how many times a particular piece of content was shared, and more importantly – who shared it. Take the first URL on our list, and enter it in the search bar. On clicking view sharers, Buzzsumo lists the twitter accounts of all those who shared the article (on Twitter). The twitter handle, twitter bio (bio), number of followers (num_followers), name, Website URL (url), location, and average number of retweets (avg_retweets). Copy and paste all these columns into another Gdoc (this will be our worksheet for the rest of the process). Now repeat this process for all the URLs that we previously collected in the first spreadsheet. 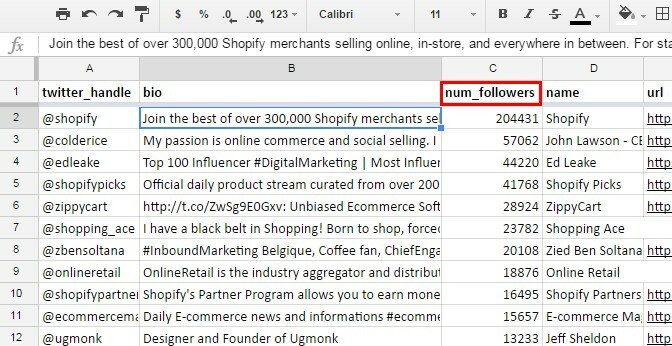 Once you’re done collecting all prospects in this manner, copy and paste all these into our worksheet doc and sort it first by the number of followers (num_followers). Remove all entries that have total number of followers below 1000. After this, sort by number of retweets (avg_retweets), and remove all entries that have an average number of retweets below 0.25. Next, just run your eyes through the bio column, and remove any entries that are official accounts of companies and not of a person (don’t get me wrong here- some founders just use the company name as their handle, and these shouldn’t be removed) or duplicates. 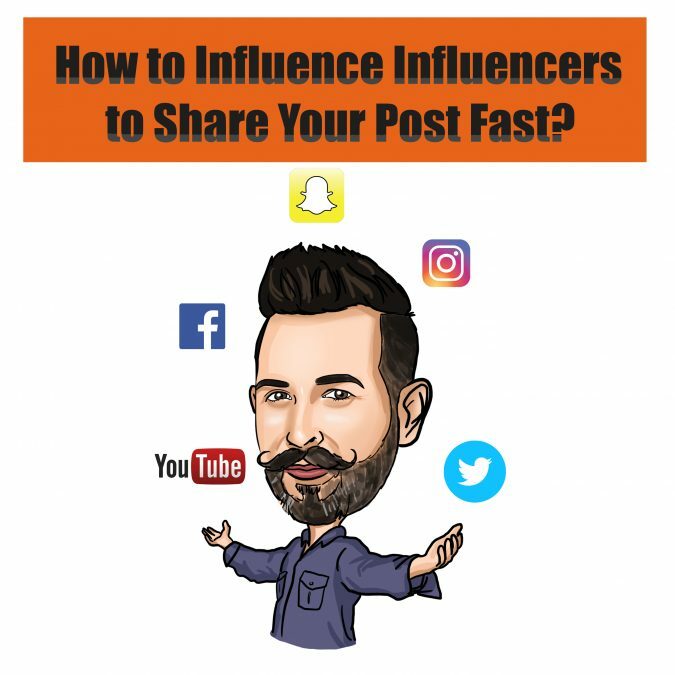 Now you have a solid list of influencers who have shared similar content in the past, and who are likely to share your content (with a bit of arm twisting, of course). This is why we have the URL column in our spreadsheet. First, install the Hunter chrome plugin. Did I say this is one of my favourite plugins that help with SEO? Hunter automatically scrapes domains and looks for email addresses. 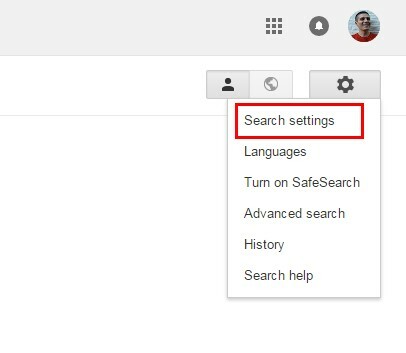 Now, go through the URLs in the URL column one by one, goto the website and click on the Hunter button in the toolbar (alternatively, you can use the nifty Google sheets Hunter add on to scrape email addresses). If Mail Tester fails to find any email addresses of the prospect, then you can resort to conventional methods of finding email addresses. I can list out all the methods, but Matthew Barby has done an excellent job of explaining all methods here. Before we start with this, there’s one question I’d like to ask you. Why do most outreach emails fail to elicit any response? The answer is simple – most people just think of outreach emails as spam, because they are sent out like spam. The key to successful outreach is building a relationship with your target prospects before asking them for favours. The personalized tweet can be anything from a random comment about something they tweeted, or a casual remark on something about them. At this point, you’re only aim is to get on their radar. Also, make a separate observation about some article they wrote (writers always tweet their posts, so just go through their tweets) and note this in a column in our worksheet. We will use this in the email outreach step. At the end of this, you should have followed all your prospects on Twitter, commented on any one of their recent blogposts, sent out a personalized tweet to them, and noted one observation about something they wrote in the worksheet. Next, fire up your Gmail account, and quickly compose a personalized email to each prospect in your worksheet. Subject: Shawn, hope you noticed my tweet! Hope everything’s going great in [insert location here]! I loved the article you tweeted out on [tweet topic]. I also read through your take on [Insert observation about the article they wrote here]. Noticed how the location data we collected earlier and the random observations we noted help in personalizing the outreach email? Would you like a heads up when it goes live? After these emails go out, I guarantee that a number of influencers will respond and ask you to send them the link to your content when it goes live. Bonus tip: The ‘feeler’ email works so well because of a reason- there is a psychological hook in it. Notice how I ask them permission before sending them the link? This shows that you respect their time. That’s all there is to it. Now just sit back and watch the shares and traffic coming in. As your content starts getting more eyeballs, you also start earning links naturally from all the additional exposure. I reach out to anywhere between 100-250 prospects depending on how much I’m hard-balling the promotion of a piece of content. Bonus tip: Always reach out to influencers whom you’ve mentioned or linked out to from the content you’re promoting. This works like crazy. Now that you know the process, do you have anything to add to it? Let me know in the comments below! According to my experience, there is hardly any technique influencers don’t know about but regardless of they still “love” we put an effort in our outreach. They love to play tough, so be patient!